Dirk Jules Gaspard Ulric Niven van den Bogaerde was born of mixed Flemish, Dutch and Scottish ancestry, and baptised on 30 October 1921 at St. Mary's Church, Kilburn. His father, Ulric van den Bogaerde (born in Perry Barr, Birmingham; 1892–1972), was the art editor of The Times and his mother, Margaret Niven (1898–1980), was a former actress. He attended University College School, the former Allan Glen's School in Glasgow (a time he described in his autobiography as unhappy, although others have disputed his account) and later studied at the Chelsea College of Art and Design. He began his acting career on stage in 1939, shortly before the start of World War II. Bogarde served in World War II, being commissioned into the Queen's Royal Regimen Dirk Jules Gaspard Ulric Niven van den Bogaerde was born of mixed Flemish, Dutch and Scottish ancestry, and baptised on 30 October 1921 at St. Mary's Church, Kilburn. His father, Ulric van den Bogaerde (born in Perry Barr, Birmingham; 1892–1972), was the art editor of The Times and his mother, Margaret Niven (1898–1980), was a former actress. He attended University College School, the former Allan Glen's School in Glasgow (a time he described in his autobiography as unhappy, although others have disputed his account) and later studied at the Chelsea College of Art and Design. He began his acting career on stage in 1939, shortly before the start of World War II. Bogarde served in World War II, being commissioned into the Queen's Royal Regiment in 1943. He reached the rank of captain and served in both the European and Pacific theatres, principally as an intelligence officer. Taylor Downing's book "Spies in the Sky" tells of his work with a specialist unit interpreting aerial photo-reconnaissance information, before moving to Normandy with Canadian forces. Bogarde claimed to have been one of the first Allied officers in April 1945 to reach the Bergen-Belsen concentration camp in Germany, an experience that had the most profound effect on him and about which he found it difficult to speak for many years afterward. As John Carey has summed up with regard to John Coldstream's authorised biography however, "it is virtually impossible that he (Bogarde) saw Belsen or any other camp. Things he overheard or read seem to have entered his imagination and been mistaken for lived experience." Coldstream's analysis seems to conclude that this was indeed the case. Nonetheless, the horror and revulsion at the cruelty and inhumanity that he claimed to have witnessed still left him with a deep-seated hostility towards Germany; in the late-1980s he wrote that he would disembark from a lift rather than ride with a German of his generation. Nevertheless, three of his more memorable film roles were as Germans, one of them as a former SS officer in 'The Night Porter'. 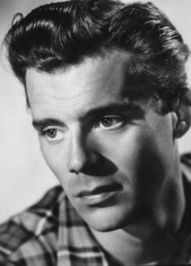 Bogarde's London West End theatre-acting debut was in 1939, with the stage name 'Derek Bogaerde', in J. B. Priestley's play Cornelius. After the war his agent renamed him 'Dirk Bogarde' and his good looks helped him begin a career as a film actor, contracted to The Rank Organisation under the wing of the prolific independent film producer Betty Box, who produced most of his early films and was instrumental in creating his matinée idol image. During the 1950s, Bogarde came to prominence playing a hoodlum who shoots and kills a police constable in The Blue Lamp (1950) co-starring Jack Warner and Bernard Lee; a handsome artist who comes to rescue of Jean Simmons during the World's Fair in Paris in So Long at the Fair, a film noir thriller; an accidental murderer who befriends a young boy played by Jon Whiteley in Hunted (aka The Stranger in Between) (1952); in Appointment in London (1953) as a young wing commander in Bomber Command who, against orders, opts to fly his 90th mission with his men in a major air offensive against the Germans; an unjustly imprisoned man who regains hope in clearing his name when he learns his sweetheart, Mai Zetterling, is still alive in Desperate Moment (1953); Doctor in the House (1954), as a medical student, in a film that made Bogarde one of the most popular British stars of the 1950s, and co-starring Kenneth More, Donald Sinden and James Robertson Justice as their crabby mentor; The Sleeping Tiger (1954), playing a neurotic criminal with co-star Alexis Smith, and Bogarde's first film for American expatriate director Joseph Losey; Doctor at Sea (1955), co-starring Brigitte Bardot in one of her first film roles.